With the show about to begin, brothers Erik and Brian Torbeck adjust their headsets, slide small hand puppets over their wrists and position themselves behind a black portable wall on the stage at the Roswell (Ga.) Cultural Arts Center. In the audience, excited children see only the puppets a Muppet-like girl with a mop of yellow hair and a dark-mustached villain who's threatening to tie her to the train tracks moving atop the wall. "Save me! Save me!" the girl pleads, and the children shriek with laughter. They have no way of knowing that Brian, 36, is operating the girl puppet, or that Erik, 38, is manipulating Bart the bad guy while the Torbecks' sister Robin Erlandsen, 32, is voicing the words of the damsel in distress. For the next 45 minutes, the children applaud, giggle and scream with delight as Little Chucky and his mysterious sidekick, The Man With No Name, outwit Bart and his band of outlaws with a fist full of bananas. Moving almost non-stop, and often shoulder-to-shoulder, the sibling puppeteers work in unison, swapping one character for another, cueing the music on a CD player, and creating diabolical laughs, funny accents and galloping sounds in The Legend of the Banana Kid. After the show, wide-eyed spectators line up to meet the siblings and their puppets. Erlandsen shows the children how she uses two fingers to wiggle the tail on Goatie, the lovable, hyperactive goat, while her brother Erik kneels on the floor, giving the youngsters a close-up view of the heroic, banana-toting Chucky. "How do you make him talk?" a little boy asks. "I have my hand in there so I can move it like this," Erik replies, as he opens and closes Chucky's mouth. The Torbecks, who comprise the Frogtown Mountain Puppeteers of Bar Harbor, Maine (pop. 2,680), live for moments like this. "It's fun just being around the kids, even though we've done the show a million times," Erik says. The art of puppetry dates back to ancient China and India. Spanish explorer Hernando Cortez is said to have brought a puppeteer with him to the New World, and British settlers introduced "Punch and Judy" shows to Colonial America. Most of the early puppets were stiff wooden marionettes animated by strings attached to their hands, legs, head and body. "We know for a fact that George Washington went to see a puppet show at Williamsburg (Va.) because he wrote it in his diary," says Steve Abrams, a Philadelphia-based puppet historian and past president of the Puppeteers of America, a group of 2,000 amateurs, professionals and puppet builders, which formed in 1937. In the 1920s, New York-based puppeteer and promoter Tony Sarg toured the country, drawing widespread attention and prompting puppeteers to begin sharing their closely guarded trade secrets. Puppetry reached new heights in the late 1950s when ventriloquist Shari Lewis debuted a simple sock puppet named Lamb Chop on the children's TV series Captain Kangaroo. Soon after, Jim Henson created his first furry Muppet characters, and builders began fashioning puppets of fabric, foam, paper and plastic. These days, puppets commonly appear in television commercials, movies and even on Broadway. "Yoda (from Star Wars) was a puppet," Abrams says. "A lot of young people who are attracted to the field now want to make special-effects puppets for films." Some 5,000 puppeteers perform shows at churches, arts centers, schools, libraries, museums and theaters across the nation. Many work in the California film industry, New York's theater community, and in venues near the University of Connecticut, which offers academic degrees in puppetry. 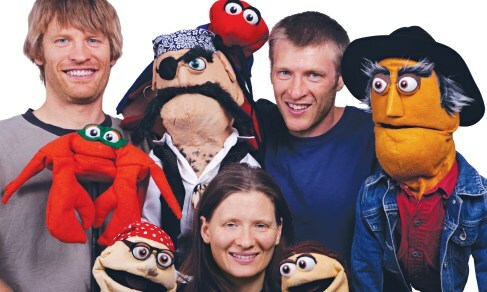 The laughter produced by their hands-on humor keeps puppeteers Bonny Hall and Jamie Keithline, both 50, of Halifax, Vt. (pop. 782), performing together after 30 years. Hall was a teenager working on a marionette performance of Winnie the Pooh in 1975 when her theater teacher asked if she'd start a puppet company at Grimsley High School in Greensboro, N.C. She went on to earn a degree in puppetry from the University of Connecticut, where she met Keithline, an amateur actor and her future partner. The couple started their own touring company in San Francisco in 1982 and later returned to New England, where they launched Crabgrass Puppeteers. "Our first show used life-size puppets," Keithline recalls. "At the end of the show the giants grew to be about nine feet tall in front of the audience." Together, the couple created 20 puppet productions, with Keithline writing most of the scripts, building stages and orchestrating sound effects, and Hall researching ideas, designing the puppets and choosing color schemes. "We absolutely love to make children laugh," Hall says. "We are pretty much addicted to that." A proficient puppeteer must be part-athlete, part-actor and part-engineer, with a keen sense of timing and a flair for comedy that can develop at an early age. Erik and Brian Torbeck were preschoolers when their parents built them a puppet stage in the basement. "We have a picture of us holding up some Sesame Street characters and other stuffed animals," says Brian, laughing. "I'm sure it was not our best show." Twenty years later, the brothers and sister Robin performed a puppet show at the Pennsylvania Renaissance Faire, near their hometown of New Cumberland, Pa. "We were just doing it for fun," Brian says. "I don't think we ever thought it would be a career." By 2000, however, the siblings had formed Frogtown Mountain Puppeteers, and now the trio travels around the country performing three different shows, including The Legend of the Banana Kid. From time to time, during a hectic, fast-paced performance, one of the siblings will make an on-stage blunder. "Once in a while we'll get distracted," Erik says. "Occasionally, an evil man's voice has accidentally come out of Little Chucky." Fortunately those unintentional slip-ups give the puppeteers a chance to laugh at themselves. And isn't that what comedy's all about? Shadow: Opaque figures appear in front of a lighted backdrop to create the illusion of movement.